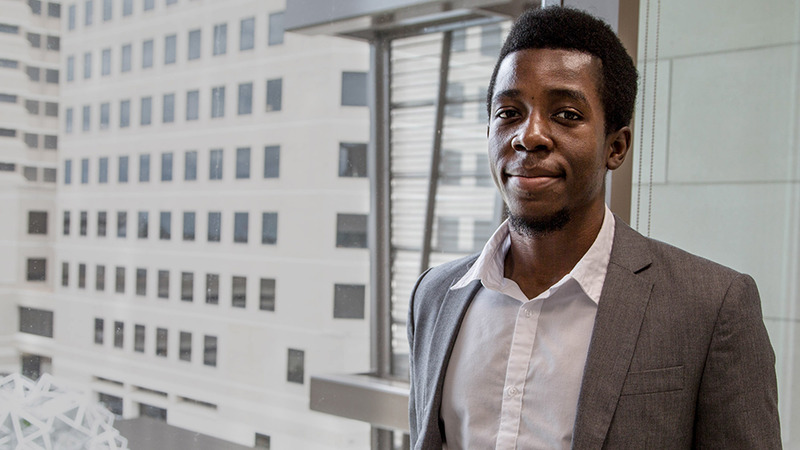 The College of Engineering at Texas A&M University recently recognized Tokunbo (T.J.) Falohun, biomedical engineering graduate student, with the 2018-19 Outstanding Engineering M.S. Graduate Student Award. Falohun said he is incredibly honored to receive this award. The department faculty nominated Falohun for the award, which comes with a $5,000 scholarship. The award was created to recognize exceptional achievement and overall performance as a graduate student. “Support from the Outstanding Engineering Master of Science Graduate Student Award will allow me to remain focused on research while learning from other professional development, engineering and entrepreneurial activities around campus,” Falohun said. Falohun works in the Biosensing Systems and Materials Lab under Department Head Dr. Mike McShane, helping to develop small-molecule biosensors—miniature analytical devices used to measure biochemicals in the body and cell/tissue samples for medical research and clinical application in chronic disease management. McShane said Falohun was an obvious choice for the Outstanding Graduate Student at the Master of Science level. Falohun has disseminated the result of his research on sensors for managing gout at various professional meetings including the National Society of Black Engineers 44th Annual Convention and the Biomedical Engineering Society annual meeting. During the fall semester, Falohun’s specific research focus is characterizing the properties and optimizing the sensitivity of the hydrogel implant used in the biosensors. In recognition of his achievements and innovative ideas, Falohun was recently awarded a National Science Foundation (NSF) Graduate Research Fellowship. Outside of the lab, he is involved in several impactful activities, including tutoring K-12 students from underserved communities in math and reading comprehension and mentoring young people to pursue higher education in the STEM fields. He also serves on the leadership council for 3-Day Startup and guides undergraduate students through a three-day entrepreneurship boot camp. Finally, T.J. is working through the NSF Innovation Corps (iSite) program to explore the commercialization potential of implantable biosensors. “In summary, T.J. has an impressive combination of academic excellence, productivity in research, and leadership in various outreach and innovation programs that make him an exceptional choice for the Outstanding Graduate Student award,” McShane said.